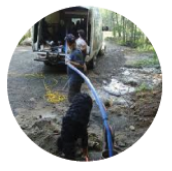 Geothermal systems make use of the relatively constant temperature of the earth through the transfer of energy. Since only the pump, compressor and fan run on electricity, the energy consumption of geothermal systems is very efficient. These elements transfer heat rather than produce it. Consequently, 3 to 4 times more energy is provided than consumed. There are various types of exchangers: closed, open, or combined circuits. Each has its advantages, depending on the installation location.